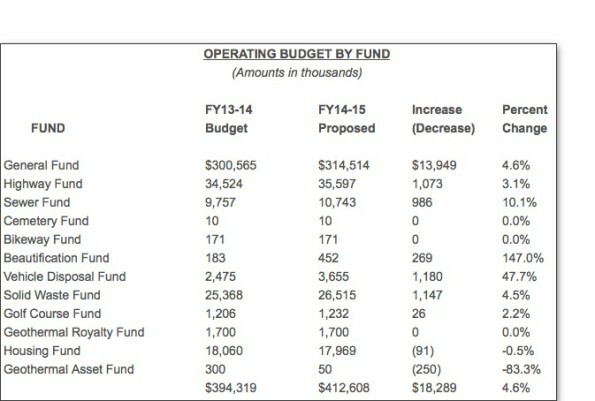 As required by the Hawai‘i County Charter, submitted with this message is the proposed operating budget for the County of Hawai‘i for the fiscal year ending June 30, 2015. This balanced budget includes estimated revenues and appropriations of $412,608,475, and includes the operations of eleven of the county’s special funds as well as the general fund. This FY 2014-2015 budget is $9,403,477 or 2.3 percent larger than the budget in effect when this administration took office in 2008. During the past five years of budget challenges caused by the national and international recession, we have continued to invest in county infrastructure while restricting spending and coping with increased health care and other costs. This budget reflects those efforts to control the cost of government while always maintaining essential police, fire and other core county government services. After five years of declining revenues, we are finally witnessing a modest, measured recovery in property values. This will gradually translate into a stronger economy and a brighter budget picture. 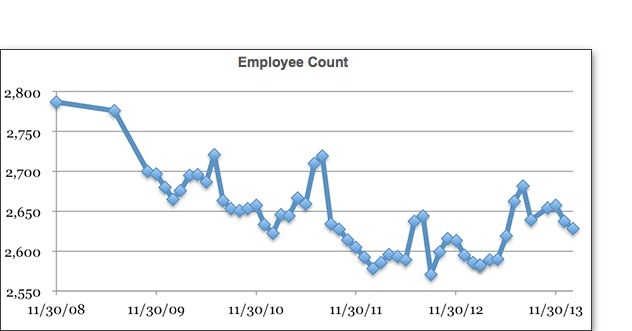 However, we also face a new challenge in the form of $18.4 million in additional employee expenses in the year ahead. Most of these costs were the result of public worker arbitration decisions and negotiated agreements that significantly increase salaries, wages, social security contributions and retirement obligations. These new employee and retiree costs reflect the difference between last year’s budget and this year’s budget. Despite those additional costs, this proposed balanced budget does not require any increase in property taxes. From the beginning of this administration, we have crafted budgets that limit spending, but also allow for targeted investment in our communities and our future. Through carefully selected initiatives we created or improved parks and playgrounds, built or rebuilt roads and other public infrastructure, and improved public services. Our primary objective has always been to make the County of Hawai‘i a better place for our families to live and work. We have used the county’s borrowing power and excellent credit rating to help stimulate the economy and create jobs during a period of low interest rates and favorable bid prices. In Kona, we answered residents’ calls for relief from traffic congestion by advancing projects such as the La‘aloa Avenue Extension, the Ka‘iminani Drive Reconstruction and the Ane Keohokālole Highway, and we will soon begin work on the Māmalahoa Bypass. In Hilo, we are repairing downtown streets starting with the Kīlauea Avenue Reconstruction, followed by the Kamehameha Avenue Reconstruction project. We will continue in the months ahead with repairs and improvements to Ponahawai and Komohana Streets. 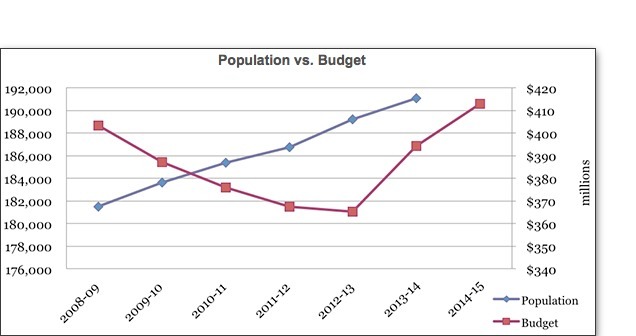 During these many challenging budget years, the size of the county workforce declined from 2,787 in November 2008, to a total of 2,628 five years later. Even with that smaller workforce, the new negotiated collective bargaining agreements will significantly increase our employee costs in the year ahead. Wages, salaries and fringe benefits including health care and retirement for all of our employees will increase in all departments by a total of $18.4 million in Fiscal Year 2014-2015, with almost all of that increase attributable to these new agreements. County of Hawai‘i tax collections in the year ahead will be $6.5 million or 2.9 percent more than the amount of property taxes collected when this administration began in 2008. However, the combined cost of employee wages, fringe benefits and health care expenses has grown by $30.44 million or 16.95 percent during the same period. Real Property Tax. Real property tax revenues are expected to increase by 5.9%, or $13 million, due to new construction and an increase in taxable values. Public Utilities Franchise Tax. 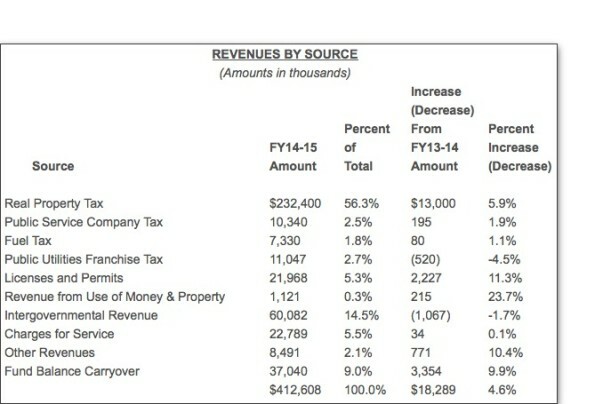 Decreased public utility revenues are expected to result in a decrease of $520,000, a reduction of 4.5% in franchise tax revenue. Licenses and Permits. Increases in vehicle registration revenue and vehicle weight tax revenue have contributed to an increase of $2.2 million, or 11.3% in this revenue source. Intergovernmental Revenue. 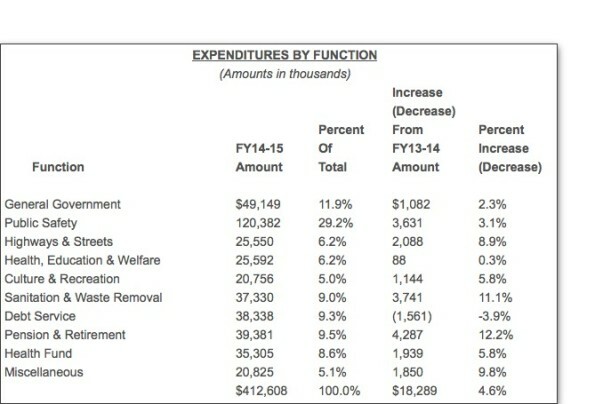 Reductions in grant revenues of about $1 million reflect those grants we are aware of at this time. Fund Balance Carryover. This budget reflects a higher projection of carryover savings ($3.3 million) from the current year operations. Increases in salary and wages are reflected in all functional areas of county government. After several years of furloughs or no wage increases, new wages were negotiated for all bargaining units represented in the county. All salary and wages are reported in each department with the exception of the Unit 11 Fire agreement, which has not yet been approved by the legislature and is estimated in the provision for compensation adjustment account. Planning. Appropriations are increased by $495,000 for work on the General Plan update. Prosecuting Attorney. Three temporary, grant funded positions have been added for victim services. The majority of other changes in public safety are attributable to salary and wage increases explained above. Public Works Road Maintenance. Approximately $350,000 is appropriated for additional maintenance equipment. Mass Transit Agency. Increased appropriations of approximately $1.3 million are attributable to an increase in the cost of insurance and bus driver contracts. Parks and Recreation Department. Eight positions to provide maintenance and recreation are being added for new locations that will be serving the public, including Ka‘ū District Gym & Shelter and ‘O‘oma shoreline. The majority of other changes in culture and recreation are attributable to salary and wage increases explained above. Vehicle Disposal Fund. An increased appropriation of approximately $1 million will provide additional funding for environmental cleanup. Solid Waste Fund. The appropriation for landfill tonnage costs has increased by about $1.7 million because of increased operations costs. Transfer to Debt Service. As the result of refinancing old bond issues, there is a reduction of debt service cost of $1.5 million for the upcoming year. Retirement Benefits. Contributions to the employee retirement system will increase by approximately $4.3 million, or 12.2%, as the result of new salary and wage costs and rate increases established by the state legislature. Health Benefits. Contributions to the state employee health system will increase by $1.9 million, which includes an increase of $1 million for future post-employment health benefits. Provision for Compensation Adjustment. This provision contains the estimated cost of salary and wages pursuant to contract negotiations that have not been fully approved, and increased by about $2 million. The $5.8 million appropriation is related to pending increases for Unit 11 Fire employees. We look forward to working closely with the County Council in the months ahead to address our community’s new and continuing demands for public services while also maintaining a balanced and responsible budget.